The VnM SignMaker is a stand-alone (no PC needed) industrial label and sign printer. It comes with easy to use templates built in to make all your labeling applications easier and faster then ever before. The VnM SignMaker prints on 1"-4" VnM Media which comes in a wide variety of OSHA compliant colors. 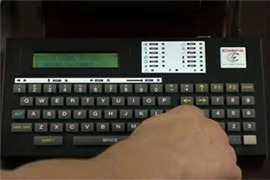 The VnM SignMaker is the easiest industrial system available. All the label and sign templates are at the touch of a button which makes creating your labels simple and time efficient. Cobra Systems has priced the VnM SignMaker System and VnM Media to be the most cost effective labeling solution on the market. Save time and money by printing only the labels you what when you need them.